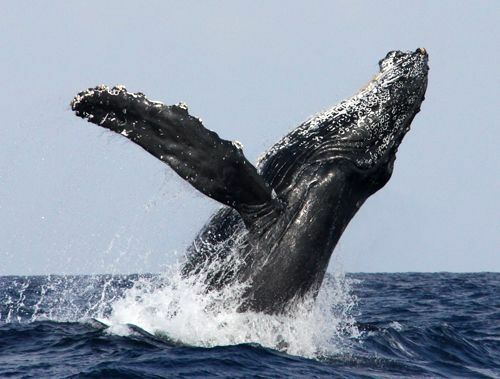 Okinawa Churashima Foundation, a general incorporated foundation, in Motobu Town, has published findings from a 21-year research project about the reproductive cycles of humpback whales that visit the ocean around Okinawa. The study focused on the peak season of reproduction when mating and delivery occur, and the analysis was published in an online academic journal. The study was conducted for 21 years, between 1991 and 2012. In that time, 1,284 random samples of male and female humpback whales’ mating patterns were recorded. The study categorized the structure of groups of humpback whales and made observations on their behavior. According to the analysis, matching pairs of male and female whales were frequently found from late January to late February. In addition, groups that consist of more than three matching pairs of male and female whales were frequently found. Meanwhile, female samples with calves increased between mid-February and late March. The study estimated that many humpback whales that visit the ocean around Okinawa reproduce from January to late February, and have a gestation period of approximately one year, delivering calves after mid-February.